Here we are again, happy as can be ……… except for 3 problems of course – this time, not the fault of Kimberley. A relay decided to end its life, meaning that the alternator in the car, was not charging the caravan as we travelled. In addition, we were unable to get the water pump to work – there was an air leak, effecting the pump suction! Today we have a gas leak! Explanation: Russ (and Kimberley) have done a massive amount of work on the van over the last couple of months and the water pump tube had been moved slightly, causing a slight air leak. Russ put a ground sheet down and that was fixed in no time! A new relay was purchased for $120 and Russ did his magic and all is fine in that department. The areas we have traversed through are The South West and The Wimmera, into the Penola region of S.A. 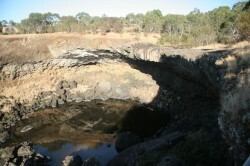 The problems were discovered at our first stop – Wannon Falls, 150 kms south of Naracoorte. In 36 degree heat, Russ deciphered the problems and we tried to relax and not let our disappointment show. The Falls were not flowing and the land is extremely dry throughout this region. Drove to Naracoorte to buy replacement parts and decided to stay 2 nights to get all things in working order, to enable us to go bush when required. Another very hot day, but waded through Naracoorte’s “Pool Lake”, which is the view from our camp. An amazing place for these parched country people (and tourists) to rehydrate. No pets allowed unfortunately, for those thinking that this would be a great place to visit. Today, we went to Naracoorte Caves, had a delicious lunch of Garfish and Salad and looked at the fossils, walked to Wet Cave and came home to see if Russ could fix the gas leak – no luck- we’ll have to go to a plumber supplies shop tomorrow to buy some fittings!! The photo below is of a Diprotodom Optatum, the largest marsupial ever to live in Australia. 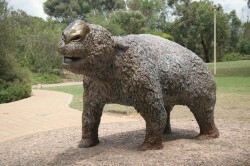 It roamed this area along with other megafauna until about 50,000 years ago. We have moved on to an overnight stop at Tailem Bend. When we arrived the battery charger did not work, fortunately it just a plug that had fallen out. However to replace the plug was a job that reminded Russ of working on a Mini! Deen will relate to that! Russ has been able to fix the gas leak so tomorrow it’s off to Kangaroo Island. …… all good friends, and jolly good company!! Thanks Deen, Dad and I both remembered that and have laughed so much recalling, that we both got the stitch! !